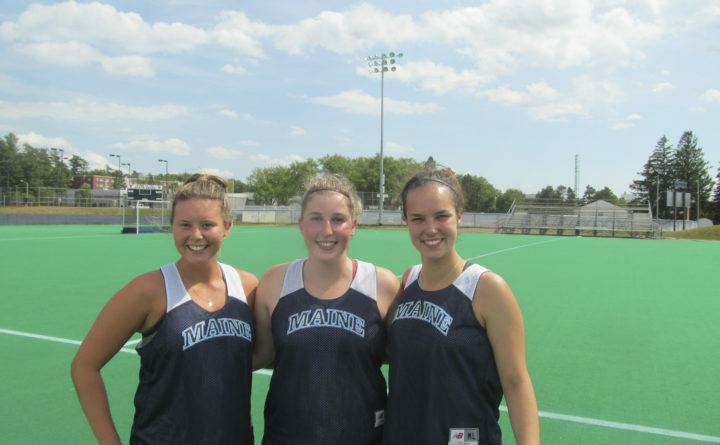 New Zealand native Casey Crowley (from left) and Australians Samantha Wagg and Emily Hindle have adapted to living in Maine and have made a major impact on the University of Maine's field hockey program. University of Maine senior Casey Crowley has been named the America East Midfielder of the Year. She was one of four Black Bears honored Wednesday night at the league banquet at Stanford University in Palo Alto, California. Crowley is joined on the AE East Division All-Conference team along with senior center back Samantha Wagg and senior midfielder Libby Riedel, while freshman forward Nina Keur was selected to the All-Rookie team. Second seed UMaine (14-4 overall, 5-3 AE East Division) takes on AE West Division No. 3 seed the University of California (5-11, 2-4) at 3 p.m. Friday in the first round of the America East tournament at Stanford. UMaine lost in the first round the past two years to Pacific and California, respectively. Crowley was the Black Bears’ leading scorer with 26 points on 10 goals and six assists. The three-time all-conference player ranks 12th all time on the school’s career list with 87 points. Wagg, a two-time all-conference pick, has anchored the UMaine defense and has contributed seven goals and three assists. She is 11th all time in goals (31), tied for ninth in assists (17) and 13th overall in points (79). “Sam is so powerful and so quick over short distances,” said Babineau, who added that Wagg does an exceptional job outletting the ball, and is a good decision-maker who is valuable on offensive and defensive penalty corners. Riedel tied Crowley for the team lead in goals (10), and she also has three assists to give her 38 for heer career, third most all time. She is a two-time all-conference choice and a three-time postseason conference award winner. “She is a natural goal scorer,” Babineau said. “She really understands the game and how to position herself. Keur has nine goals, tops among AE rookies, with two assists. “She is another natural goal scorer. She is very composed around the goal,” Babineau said.